par Ben W. Heineman Jr.
Our free-market capitalist system is the world's greatest driver of prosperity, but it has a dark side. Under intense pressure to make the numbers, executives and employees face temptation to cut corners, fudge accounts, or worse. And in today's unforgiving environment, such lapses can be catastrophic. Fines and settlements have amounted to billions of dollars. Careers and companies have imploded. 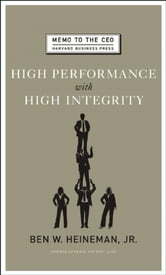 In High Performance with High Integrity, Ben Heineman argues that there is only one way for companies to avoid such failures: CEOs must create a culture of integrity through exemplary leadership, transparency, incentives, and processes, not just rules and penalties. 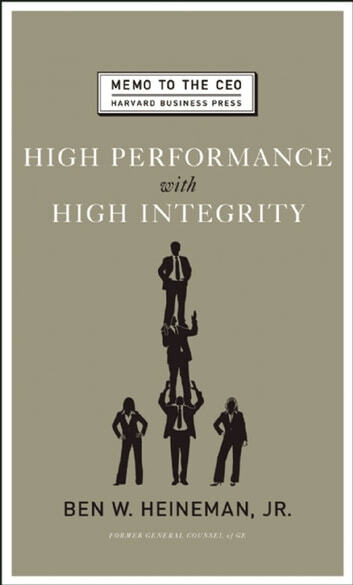 Heineman, GE's chief legal officer and a member of both Jack Welch's and Jeff Immelt's senior management teams for nearly twenty years, reveals crucial "performance with integrity" principles and practices that you can begin applying immediately, and shows how you can drive performance by integrating integrity systems and processes deep into company operations. Such principles and practices also create affirmative benefits: inside the corporation, in the marketplace and in society. Concise and insightful, this book provides a much-needed corporate blueprint for doing well while doing good in the high-pressure global economy. From our new Memo to the CEO series--solutions-focused advice from today's leading practitioners.